Following an introduction speech by Darrell Webb, president of the Gospel Music Association, and a video spotlighting Adams and special moments in his family life and musical career, a plaque was presented to Adams. He was then joined by his lifetime Gospel group, Trinity, who joined in singing his Gospel favorite, “Lighthouse,” to the standing ovation of those there. Adams, who shed tears freely, admitted some of the emotionalism was brought about by his daughter, Kimberly Owens, who passed away just a brief time ago. A few years ago, Adams, who still has a son, Jason, lost a son, Chris Adams. Adams, who was born in Wetzel, married Barbara Dougal on April 21, 1957. His exposure to Gospel music began with his father and mother, who played the piano for a Gospel group known as the Zion Singers. When his father’s health began to fail, he filled in. 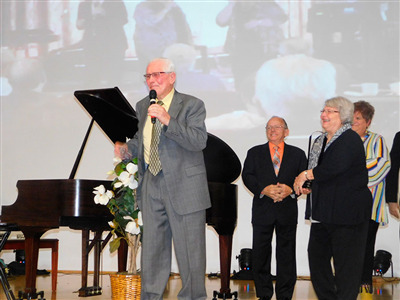 He eventually sang with his mother and mother-in-law in a group known as the “Zionaires.” In 1982, he founded his lifetime group, Trinity, which continues to travel and sing, and has served as the foundation for the local Gospel Expo weekend each spring. Trinity began with male singers, Scott Fleming, and Chuck Dunham. As group members began to follow other calls, the group was joined by ladies Pam Smith, Betty Dunno and Kyann Renner from Huntington, Ind., in the Trinity Quartet. For the past 26 years, the group has consisted of Adams, Cheryl Burk, and Kim Mason. While the group sings mainly in the Midwest, they have performed also in Florida and Texas. These days, Adams remains actively involved as a member of the Trinity Friends Church where he has served as song leader, member of the administrative council and member of the stewardship and finance commissions. A farmer by trade, Adams retired from farming in 2013. For many years, Adams officiated high school basketball and was later involved in the Upwards Basketball program. He was also inducted into the Ohio State Basketball Officials Hall of Fame. Other county service included 12 years as Township Trustee and 28 years as County Commissioner, the longest tenure in county history on the job. “I always kid about how difficult it was singing with two older women, but it really was very nice,” quipped Adams. “My mother always prayed that I would continue to sing with a new group. She said, ‘you don’t want to be singing with old people.’ So now the old man is singing with two young girls. “One thing we can say is that God always meets our needs and when He calls us to sing, He is faithful to seeing that it happens,” said Adams. “When we go from place to place, I love to meet with pastors,” continued Adams. “Sometimes they have an empty feeling in their hearts, and we are able to pray with them. Saturday evening it was all about Adams and the Lord He serves. Many people crowded in to shake his hand as he exited from the stage to the back of the auditorium.